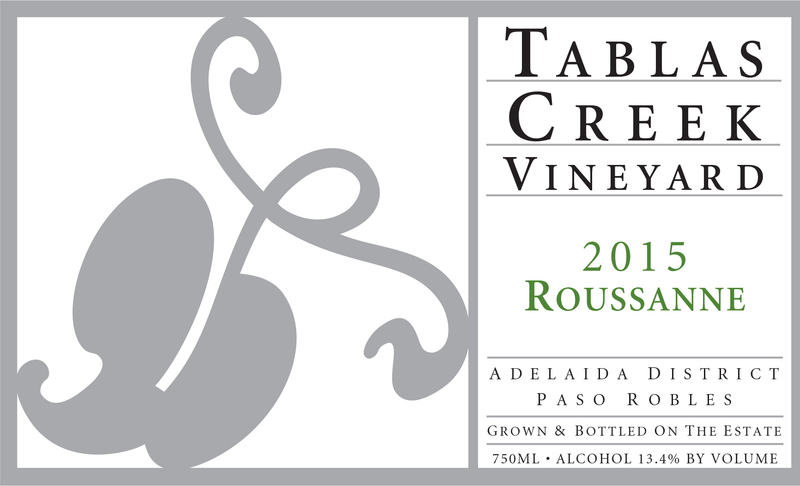 The 2015 Tablas Creek Vineyard Roussanne is Tablas Creek’s fifteenth varietal bottling of our most important white grape. The wine is exuberantly and elegantly in character of the Roussanne grape, with honey, honeysuckle, and pear aromatics, a rich, viscous mouthfeel with just a hint of oak, and a long, lingering finish. The 2015 Roussanne has a rich nose of pineapple, honeycomb, butterscotch, jasmine, and a little cedary oak. The mouth is broad and rich, inviting, with ripe pear, beeswax, custard, baking spices and a nice savory firmness that reminded me of apple skin cleaning things up on the long finish. A wine to enjoy now or to hold for a decade or more. We use most of our Roussanne in our Esprit de Tablas Blanc each year. However, we often have some Roussanne lots in the cellar that are so powerfully characteristic of the varietal that we feel it would be a shame to lose them in a blend. In these cases, we reserve a small quantity of this Roussanne for a single-varietal bottling. Our Roussanne grapes were grown on our certified organic estate vineyard. The 2015 vintage saw dramatically reduced yields from the combined effects of four years of drought and cool, unsettled weather during May's flowering. Months alternated between significantly cooler than normal and significantly warmer than normal, which produced an early start to harvest but required multiple passes through most vineyard blocks during a long, drawn-out picking season. Yields were down as much as 50% in early-ripening grapes like Viognier, while later grapes like Roussanne were only down slightly. The result was a vintage with excellent concentration but unusually good acids, and wines with dramatic perfume, texture, and intensity. Our Roussanne was harvested between September 15th and October 28th. The Roussanne grapes were whole cluster pressed, and fermented using native yeasts in neutral 1200-gallon French oak foudres (55%), neutral 132-gallon French oak puncheons (35%) and new 60-gallon barriques (10%). The lots were left on their lees for 6 months, and allowed to complete malolactic fermentation. After fermentation the lots were blended, and bottled in December 2016. The wine underwent only a light cold stabilization before bottling.